From the day I first heard about HP’s plan of enter the 3D printing market, I wondered where they might focus their energies. The consumer market or high volume production? As time went on and more details became public, their intentions became more clear. HP announced that it would focus on the production or “enterprise” portion of the market. For a company like 3DLT, that was exactly what we were hoping to hear. While we sell files that consumers can print at home, our core business is helping retailers offer 3D printable products online and in store. It’s our contention that doing so, in the short-term, will help them drive traffic, build engagement, and sell more stuff. Longer term, as consumers become more aware of the benefits, and the demand for 3D printed products grows, our retail customers will be uniquely positioned to meet the need. Up until recently, the technology just wasn’t ready. Quality wasn’t good enough, print speed was slow and 3D printing was expensive. That’s changing for many reasons. Key patents have expired, crowdfunding has allowed more new players to enter the market, the general pace of innovation has increased exponentially, and big players (with big resources and big R&D budgets) like HP are joining the fray. HP operates at an entirely different level of scale. Imagine if tomorrow, one of 3DLT’s customers said they wanted to install 3D printers in all 5,000 of their brick & mortar stores. While the prevalent suppliers of today’s 3D printing technology might be able to deliver the gear, could they support that kind of growth in their install base? HP could because it does today in 2D printing with global sales, service, and supply organizations. It represents a significant opportunity for a company like 3DLT. So, a few months ago we reached out to learn more. We had some initial conversation, but it didn’t really go anywhere. We assumed they were focused on their launch and would contact us when the time was right. Then we pitched at The Dark Horse Competition. 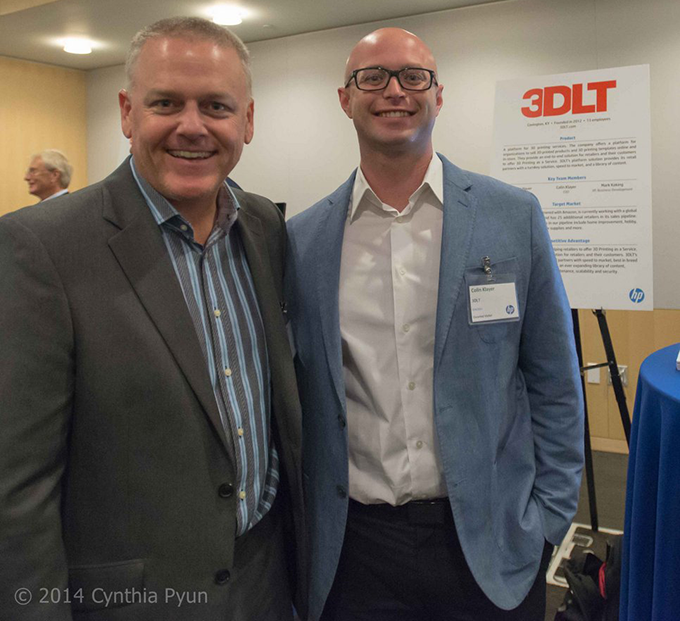 Afterward, I was approached by an angel investor who asked if I was familiar with HP’s plans for 3D printing. I told him I was following their progress in the news but didn’t have any real inside knowledge. He told me his son was working for them and asked if I had heard about the 3D Printing Showcase they were planning. I said no and he offered to share our story with his son. A week or so later his son called me and explained that HP was planning to conduct the showcase at its Palo Alto headquarters in early September. They expected to invite 20-25 companies with which they could potentially partner. I told him we’d be thrilled to be included. After a few more meetings 3DLT was invited to attend the event. I honestly had no idea what to expect. I knew that over 200 companies were considered and less than 25 were invited, but had no idea who they were. I also knew that the show would be attended by HP execs and some members of the Silicon Valley venture community, but again, didn’t know exactly who we might meet. We were coached on how to prepare, but it was just hard to put in context. They say that confidence is that feeling you have before you understand the situation. I’ve pitched in front of dozens of groups, large and small. You can practice all you want, but its impossible to prepare for every environment and contingency. Sometimes you just have to roll with the punches. That was my mindset walking in the door the day of the event. The room reminded me of the setup at TechCrunch. No booths, just high top tables, monitors, and an easel with a synopsis of each company. I looked around and was immediately excited to see that two of 3DLT’s business partners, 3D Industri.es and Authentise were also there. Beyond that it was a who’s who of 3D printing. Digital Forming, Secured3D, 3D Hubs, NetFabb and Materialize were all there, among others. We were excited to included among that prestigious group and enjoyed the opportunity to network with such a great group of peers. The event started promptly and soon the room was full of people, including some of HP’s top executives and representatives from some of the area’s most well known VC firms. Our table was busy non-stop. We had many opportunities to pitch our business, answer questions and discuss how we think 3D printing As-a-Service will change the way people buy things. I can’t wait to continue those conversations over the coming weeks. As I sit here on the plane on the way back home, I’m struck with a couple of observations. First, the pace of business in Silicon Valley is light speed compared to the mid-west. But it doesn’t feel hurried or overly formal. People are relaxed yet at the same time very passionate about their business. It’s also clear that out there, 3D printing is on the radar screen big-time and that is an exciting validation of the ecosystem and what we’re building here at 3DLT. On behalf of our entire team, I’d like to thank everyone at HP for inviting us to the 3D Printing Showcase and for their hospitality at the event. What an amazing experience! About the author: John Hauer is the CEO of 3DLT and our partner for 3DFaster. Working mainly in the print, eCommerce, and retail industries, he has nearly 25 years of sales, marketing, and technology experience. John has launched and managed several B2B and B2C websites. In 2012 he co-founded 3DLT, connecting the designers, consumers and producers of 3D printing. 3DLT sells direct and works with retailers, helping them build 3D printing service offerings online and in-store. great, so what did you learn? you went to an event. lots of people from the world of 3DP were there. your table was busy. so what did you glean from the HP folks?